Apple has finally received clearance to bring its electrocardiogram (ECG) feature to Apple Watches in Europe. The feature has been available in the US since December 2018, following tests with the Food and Drug Administration (FDA), but now moves to other parts of the world. 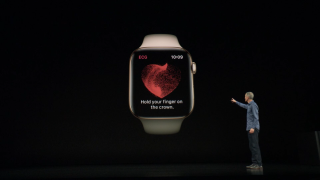 The ECG capability will only be available on the Apple Watch 4, as that has the electrodes built into the Digital Crown and rear of the Watch. However, the capability to monitor for irregular heart rhythms, specifically atrial fibrillation (AF, chambers of the heart are beating out of sync, and can cause strokes) will be brought to all models. How does the Apple Watch fare on our list of the best smartwatches? And if you're thinking about buying one, how about a great Apple Watch deal? The AF Association estimates there are 1.5m people in the UK alone with AF, but 500,000 undiagnosed - which is where Apple is aiming this feature. However, most of those are of retirement age, which historically hasn't been a key demographic for buyers of the Apple Watch. If a user of the Apple Watch 4 does feel something untoward with their heartbeat, they can take a 30 second ECG test and the results will be stored in the Health app on the iPhone, which can then be shared with doctor via PDF. The feature will roll out as part of the WatchOS 5.2 update, which is now available.